In this article, we will see how to manage Error Handling in struts framework. Also we will learn why we need to validate the web application activities and their types. Struts action class is one of the most important classes in struts framework. The action class holds the main execution piece of code. So in this framework, the action class is also used to handle errors. In this article we will discuss the error handling part of struts action class. Web application is being very complicated day by day with their performance point of view. It should be very light-weighted to be loaded. While user interacts with the web application, it is necessary to validate each and every activities is made for the valid information by the user. This validation can be made at the client side or at the server side. The client side validation helps to remove occurrence of error message before hitting the application server. But The server side validation are made, while the information has been submitted to the server. The Struts framework helps us to handle server side error into the web application. 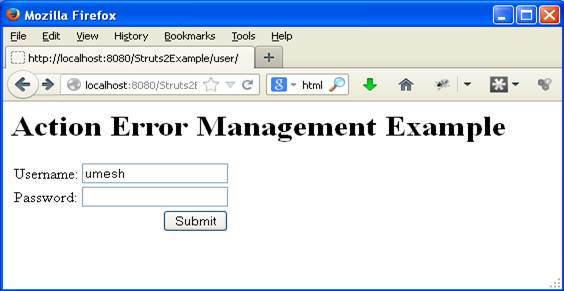 Struts framework is very easy and light-weight mechanism to handle server side errors occurred in a web application. Struts defines action library to manage these errors. It provides two main classes that help us to manage error occurred into the web application named ActionError and ActionMessage. ActionError class is used to send error status to the user using struts tag library, where is uses tag <s:actionerror/> to inform user about error status. Listing 1 defines an example to handle the error against the invalid information input the user into the web application form. It checks for the error status using the method “hasActionError()” method and displays the error message, if there is an error is returned into the “error” div. ActionMessage class is used to send message or information to the user using struts tag library, where tag <s:actionmessage/> is used to place the message to the user. Listing 2 defines the ActionMessage example that validates the message status using “hasActionMessage()” method, if there is a message to be displayed, it is rendered using tag <s:actionmessage> and displayed into div. Let’s go with an example that will manage login of the user and will display the welcome message to the user with its name, if successful, otherwise an “invalid login information” error message will be displayed to the user. Listing 3 defines global.properties file that defines username, password, submit and reset variables to its specific pre-defined values. Listing 4 defines LoginAction.java class file that defines two String type class member variables that should have the same name as defined into .jsp file of the login page and also defines getter() and setter() methods to these variables. It also defines execture() and validate() methods. The execute() method return “SUCCESS” that informs struts to load the result “SUCCESS” with .jsp file “welcome.jsp” else “login.jsp” file. Listing 5 defines tag that defines namespace “user” with its two actions “login”, “invalidUser”. The action “login” is loaded automatically using tag <default-action-ref> tag. 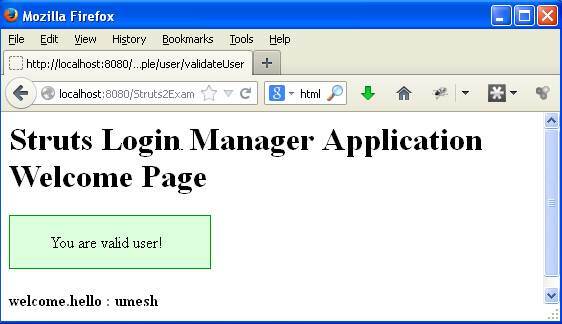 The action “login” loads “login.jsp” page and “validateUser” loads “welcome.jsp” page. Listing 7 defines the welcome.jsp page that welcome the user with its name and the welcome message using the tag <s:if test = “hasActionMessage()”> and displays the message into the “welcome” class div using tag <s:actionmessage/>. To get access the username into the welcome page, property tag <s:property value = “username”/> is used and to get welcome message property tag <s:property value = “getText(‘welcome.hello’)”/> is used. Listing 8 defines the web.xml configuration file that defines the struts filter dispatcher class mapping to all the hitting urls. All the url should hit and transferred to struts.xml file to perform the relevant action using class name “org.apache.struts2.dispatcher.FilterDispatcher”. Figure 3 displays the welcome.jsp page with the welcome message and username entered by the user. Figure 4 shows the struts 2 jar files to run struts 2 web application. In this article, we learn about the need of ActionError and ActionMessage class and also learn about way of using these classes into the struts web applications. We also learn about the use of properties file into your web applications.